‘The most useful thing about art is its uselessness.’ At least, so says Tom Robbins. If we begin with his premise, then what are we to make of his latest offering, a collection of short works entitled Wild Ducks Flying Backward? Is it usefully useless? Perhaps. Some bold explorers may find his travel articles useful. Otherwise, the various bits and pieces on display here are cheerfully lacking in utility. That is not to say that Wild Ducks Flying Backward is necessarily art, though. Robbins’ exploits in short form consist primarily of journalistic tidbits – including responses to standard prompts and a few pieces of criticism – along with some philosophical digressions. The fiction, poetry and, yes, two country songs, appear to be wistful experiments and one-off diversions rather than anything Robbins would like to have taken seriously. But can we truly expect that the author of an essay titled ‘In Defiance of Gravity’ (not of the Newtonian variety) and an ode to a salt-and-pepper shaker collector/entrepreneur (with the eccentric moniker ‘Ruby Montana’) wants to be taken seriously? Yes and no, if we are to believe Mr Robbins himself. In ‘In Defiance of Gravity’ he extols the virtue of what he dubs ‘serious playfulness’, and this approach to life and his work is evident throughout all the pieces in this collection, from his paean to a pink hotel in ‘The Eight-Story Kiss’ to his earnest tribute to ‘The Genius Waitress’ and his amusing take on Satan and evil in the poem ‘Triplets’. This book is not going to change the world. But that’s okay. Of the sixty-eight pieces here (seventy if you count the ‘Three Haiku’ separately), the fiction and poetry are perhaps the least interesting. Certainly Robbins’ vivid prose, which has been a characteristic of his writing, is present throughout, as is his irreverent sense of humor. His short story, ‘Moonlight Whoopee Cushion Sonata’ is as mystical, playful and culturally marginalised – dealing, as it does, with both witchcraft and flatulence – as you would expect of Robbins’ fiction, and ‘The Towers of St Ignatz’ (a movie treatment, according to the author) is as zany as any of his novels. But the unshuttered view of his mind – only obliquely displayed in his fiction – is the real meat of Wild Ducks. Whether reading the qualified homage to his country of residence in ‘How Do You Feel About America?’, the heartfelt admiration of his critique of an art exhibition in ‘Morris Louis: Empty and Full’, or the primal enthusiasm for female genitalia in ‘Canyon of the Vaginas’, Robbins’ words leave a clear trail back to a sensitive, discerning intellect with a counter-cultural slant. 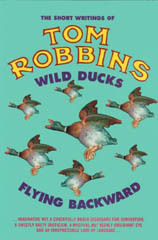 For fans of Robbins, Wild Ducks will be a welcome window into the inner workings of this colourful author. And for those unfamiliar with his prior work, his unmistakable love of language and life just might rub off.